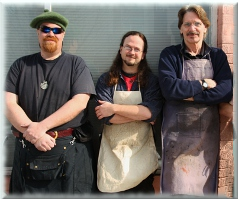 Terence Plunkett, principle artisan of Renaissance Leather, has been in the trade since 1968, with retail stores and wholesale operations in Connecticut and Bar Harbor, Maine before joining the Colorado Renaissance Festival in 1995. Starting out with a line of leather goods geared toward the every day crowd, he quickly developed a line of belts, bags and accessories for the costumed patrons of the fairs. Adding the Texas, Michigan and Minnesota Renaissance Festivals over the next few years, and with the addition of assistant artisans, Ian Hawkins and Travis Butterworth, we have established ourselves as a distinctive presence on the Renaissance Festival circuit and on the web, reinterpreting traditional craft techniques to produce leather goods of the highest quality of design, materials and workmanship. Please peruse our site or come visit one of our shows, we welcome all comments and questions.